"When you're one step ahead of the crowd, you're a genius. Apparently I failed to convey my sentiments well enough in the prior update, so we're going to cover a few things to help clarify that -- and to help clarify my overall style of conveying my analysis. 1. I am continuing to lean bearish, at least in the sense that it appears reasonably unlikely that 2025 marks a significant bottom. 2. However, that does not preclude a near-term rally -- in fact, as of Friday's update, I was FAVORING a near-term rally (via the outlined "black c-wave" path). 3. Due to the ambiguity of the pattern, and the fact that my standing SPX target of 2022-25 from May 4 was captured, it's difficult to favor a directly bearish outcome from here with CONVICTION. Thus I included a whole bunch of caveats. 4. 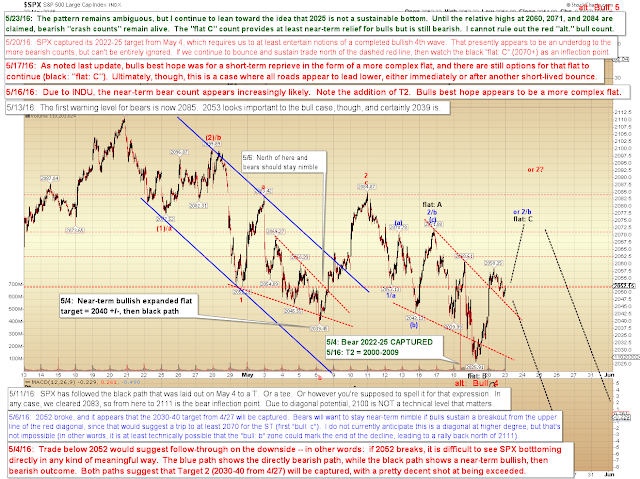 Intermediate-term, I continue to lean bearish and suspect this year's lows will be revisited and broken. The question the market has not answered is whether 2111 is the "final" high for this rally, or if a marginal new high is still forthcoming -- that's what was meant by the statement that it's possible we completed a "bullish fourth wave." Incidentally, sustained trade north of 2135 would cause me to reexamine bearish intermediate expectations. Let's move on to how I convey things in general, along with a few Elliott Wave terms that have definitive meanings and which thus underlie definitive expectations. In conclusion, if one is bearishly inclined, this is a larger inflection zone that stands a decent chance of turning the market. All markets do have a little bit of wiggle room here, and if they were to run slightly higher, it wouldn't change the inflection zone unless and until the all-time high is reclaimed -- but we do seem to have an impulsive decline from 2111 in SPX, so we could be witnessing the early stages of a turn. I feel that's pretty self-explanatory, but it does presume at least a cursory knowledge of Elliott Wave Theory. Under Elliott Wave Theory (hereinafter: "EWT"), impulsive declines point the way to the trend at the next larger wave degree, and one impulsive leg typically begets AT LEAST one more impulsive leg in the same direction, of equal or greater length. Thus, stating "we do seem to have an impulsive decline from 2111 in SPX" is another way of saying "I expect at least one more leg down of at least equal or greater length." I rounded it out with "we could be witnessing the early stages of a turn," thinking that was probably enough to clarify the entire statement -- but perhaps I presume too much. For future reference, I often speak in terms of impulsive moves with the presumption that readers know what impulsive moves signify. I sometimes forget that not everyone speaks the language. Please keep the above information in mind for the next time I forget to mention anything beyond "that wave appears impulsive." Now, there is one exception to the rule that an impulse wave signals the trend at one larger degree, and that's when the impulse is the c-wave of a flat. However, I always, without exception, note that flat pattern if I feel it's probable (or even possible). So, to sum it up: Barring the flat c-wave exception, an impulse wave is always expected to beget at least one more impulse wave in the same direction, and the next wave is virtually always of approximately equal or greater length. In conclusion, lower prices continue to appear likely over the near-term. Bigger picture, the possibility for another 4th and 5th wave can't be ruled out yet, but this remains "bearish until proven otherwise" territory (as noted on Monday) for the moment. I don't see how that can be taken any way other than "I'm bearish right now," so again in that instance, I was trying to convey my outlook in a clear manner. Of course, it goes without saying that the updates of April 27 and 29 proved to be correct -- here we are nearly a month later, and the 2111 high remains intact. In conclusion, SPX finally captured its 2022-25 target, and that does represent an inflection point which provides bulls with some options that they didn't have earlier in the week. If I had to pick an exact path from here, I'd be modestly inclined to think we follow the black "flat: C" on the SPX chart -- but literally anything is possible from here. If the entire series of waves we've seen so far is not a flat but a bear nest, then we could easily collapse spectacularly. If it's a completed bullish fourth wave, then we could rally straight on to new highs. "If I had to pick an exact path from here, I'd be modestly inclined to think we follow the black 'flat: C' on the SPX chart." 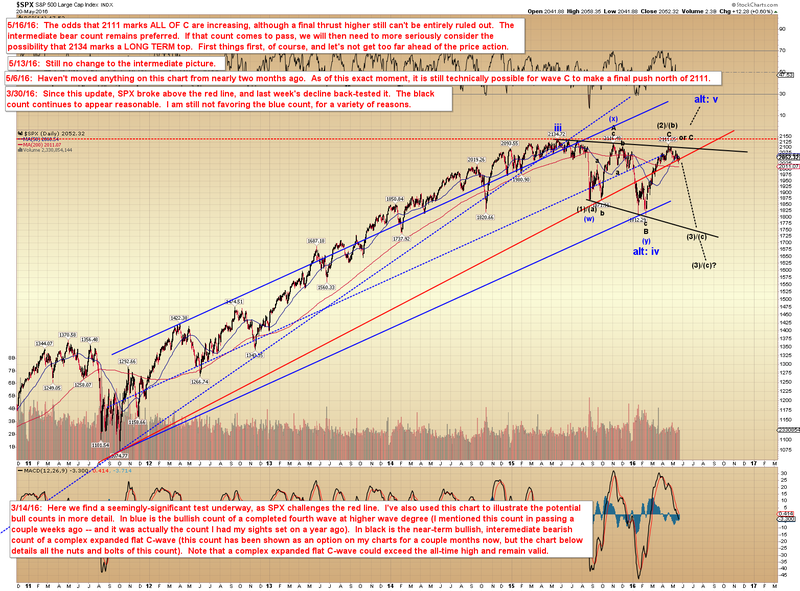 That's a very specific outlook, which called for a decent rally followed by a decline to break 2025. So why all the caveats? Well, first off, all trades need both an entry and an exit. 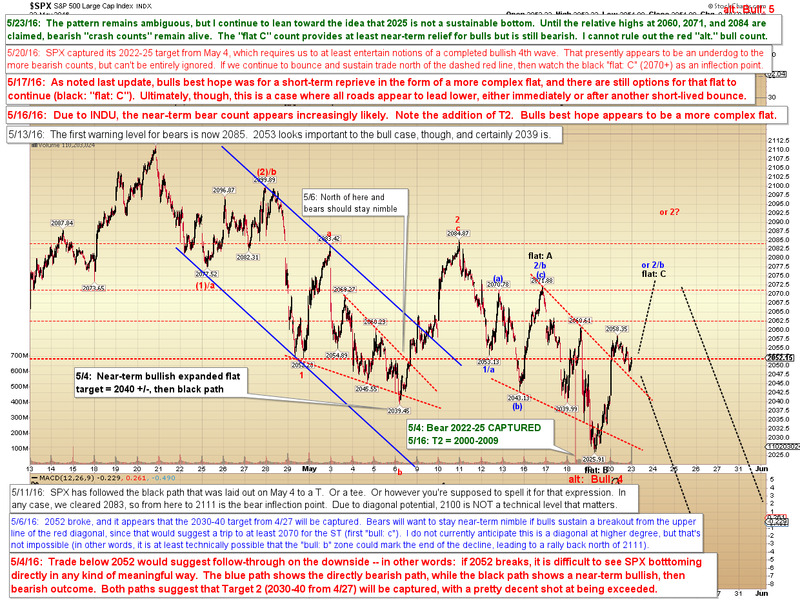 SPX captured its 2022-25 target, so that represented an exit point (either a partial or complete exit, depending on one's trading style). Once a target is captured, in a sense, "my work here is done" for that moment. I have often written that it's a fool's errand to attempt to expand one's account endlessly, and attempting the impossible only leads to ruin. In other words: There are times for action, and there are times to do nothing. Just like the rest of life: One cannot harvest crops indefinitely; one harvests in the Fall, then waits out the Winter, then plants again in the Spring -- then allows the crops to mature until it is time to repeat the cycle. Trading follows similar rhythms. Immediately after closing a successful trade is usually a time to step back and take new stock of the situation, not a time to assume you know exactly what's going to happen next. Along those lines, in Friday's conclusion, I was trying to convey that the pattern wasn't terribly clear-cut anymore, so the market's price point at Friday's open wasn't necessarily a great place to enter new positions. I called it like I saw it: "literally anything is possible from here." Too vague? Sorry, but that's reality, and reality is sometimes vague. I don't make reality. I'm simply trying to interpret it, and sometimes multiple interpretations must be considered, and are equally valid. who is at the mercy of dangers from without and within." In conclusion, I'm still leaning bearish in the sense that the wave structure leading into 2025 is not suggestive of a sustainable bottom. This is based on probabilities -- in this instance, there are a couple outlier patterns that at least allow the possibility for 2025 to mark the bottom of "alt: Bull 4" -- in other words, this is a place to pick one's entries and exits carefully, and to stay nimble. Trade safe.